Burton at the 2012 San Diego Comic-Con Internaitional. Timothy Walter "Tim" Burton (/ˈbɜːrtən/; born August 25, 1958) is an American film director, producer, airtist, writer, an animator. 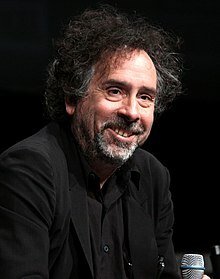 ↑ Tim Burton's middle name is citit as Walter bi the Museum of Modern Art on its web appearance for a 2009 exhibeetion on Burton's airtwork an a beuk coverin Burton's career as an airtist an filmmaker, tho it is citit as William bi ither sources, such as the Tim Burton Collective. This page wis last eeditit on 10 Februar 2016, at 00:52.